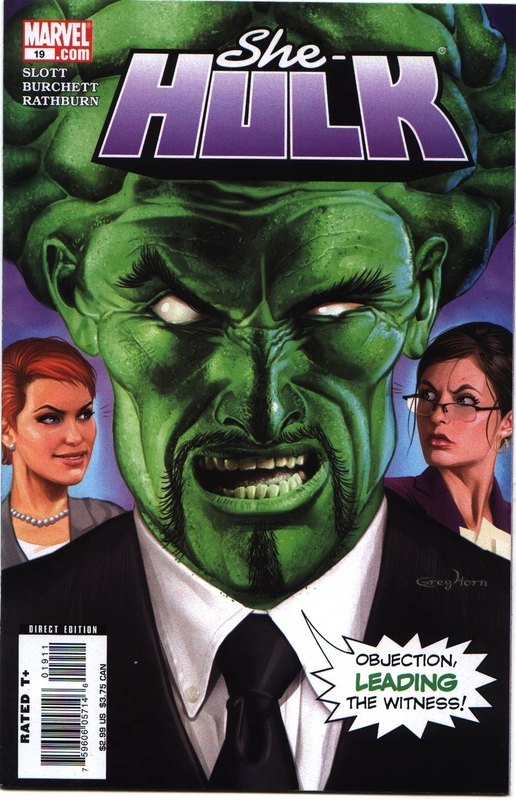 *Slott and Templeton apparently traded off plot and scripting duties on the three issues of She-Hulk they wrote together. I suspect that Slott, who was also writing The Avengers: The Initiative at the time, needed some help meeting deadlines. The final Slott issues are a lot of fun, but they're slightly manic (some of the pages have ten to eleven panels on them) as he seems to be racing to wrap up all his plotlines before passing on the series to new writer Peter David. *Panels from previous She-Hulk comics get sampled into the art for a cool effect when Jennifer Walters, She-Hulk's alter ego, is on the witness stand. 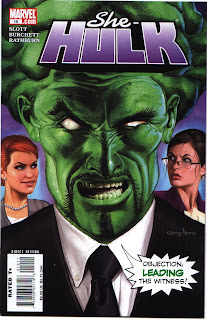 Walters's rival, Mallory Book, is trying to argue that gamma radiation, the source of The Leader's and She-Hulk's powers, makes people affected by it addicts and unable to control their behavior. As evidence, she shows how Walters has always preferred being She-Hulk to being herself ever since she got the blood transfusion from her cousin The Hulk (Marvel probably explained this away at one point, likely due to the shared DNA between Bruce Banner and Walters, but why don't more people in the Marvel Universe try to get some blood from Banner so they too could turn green, walk around in their underwear, and smash things? ).